What dramas will unfold at high school baseball's 'Field of Dreams' this year? 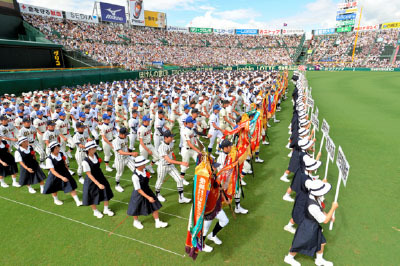 The list of memorable games at the National High School Baseball Championship at Koshien Stadium is a long one. But one I can never forget is the final game of the 1996 season between Matsuyama Commercial High School of Ehime Prefecture and Kumamoto Technical High School of Kumamoto Prefecture. Of course, the game just had to go into extra innings. With the score tied 3-3 in the bottom of the 10th, Kumamoto got a potentially game-deciding rally going by loading the bases with one out. When a big sacrifice fly arced its way into right field, it looked as if the game was over. But it wasn't. Matsuyama's right fielder executed a laser beam throw to the plate, where Kumamoto's third base runner was tagged for a double play. The right fielder's feat is still celebrated today as "Kiseki no bakku homu" (miraculous throw to the plate). An old baseball powerhouse, Matsuyama went on to score three runs in the top of the 11th to win its first championship in 27 years. Because I used to cover this school as a cub reporter, it had a special place in my heart. Watching that 10th inning play on television, I felt something like an electric tingle at the back of my skull. This summer, too, I am sure many dramas will unfold at Koshien Stadium. The tournament kicked off on Aug. 11, two days behind schedule due to Typhoon No. 11. Reportedly, this unprecedented postponement forced the cheering squads of some high schools to return home. The six teams that played on the first day must have taken pains to readjust physically and mentally to the revised schedule. Some teams actually took advantage of the delayed start to get a much-needed rest. For the players who were still fatigued from the regional qualifying games, the typhoon was probably a godsend. It is often pointed out nowadays that high school baseball overtaxes pitchers. True, taking the mound in consecutive games in the punishing heat of summer can be pretty brutal. Such an extreme exertion may deeply impress fans, but there will be no future for teenage pitchers if they throw their arms out. Something must be done to prevent this from happening. The Kyushu-Shikoku edition of The Asahi Shimbun reported in June that the Matsuyama right fielder and the Kumamoto third base runner in that climactic 1996 game had a reunion last year. This enabled them both to start focusing on the future, freeing them from the torment of being remembered forever as the "winner" and "loser" of the summer of 1996. Koshien Stadium will continue to weave dramatic stories.